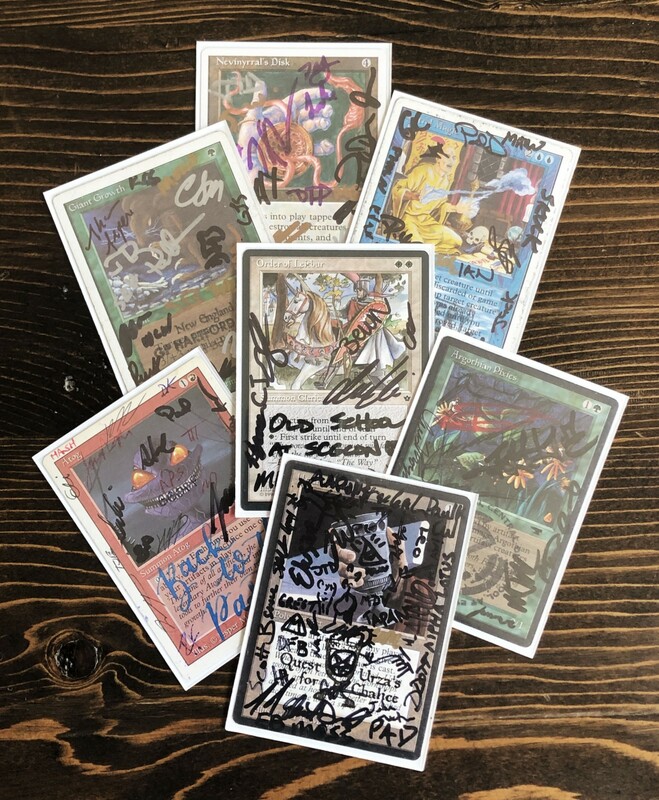 A few of my prize cards from events in NYC, Hartford, Pittsburgh, DC, San Fransisco, and Roanoake, VA.
That being said, there’s a longer answer that I touched on that day and that I’d like to expand upon here. Old School is a wonderful format that’s about nostalgia, history, community, and jank brews, but the format also has a boogie man and I’m not referring to The Deck. Card values have skyrocketed, buyouts are rampant, investors have entered the arena. Yes, the true boogie man of the Old School format is named MTGFinance. As Old Schoolers, we can’t pretend that we’re not happy when cards we already own go up in “value” but on the whole, most of us are unhappy with the current trends driving prices upward. The futility of it all affords us little recourse aside from attempting to keep cards within the community and cut deals with people who are known within the circle. With that in mind, what the signing of these cards represents is more than simply a memento: it’s a destruction of value. That Unlimited Sol Ring covered in scribbles by a bunch of random, tipsy dudes just became a $0 card. It’s been stripped of any connection it once had to buylists, MTGStocks, and eBay sold. It has been irrevocably reduced to its most pure form, that of functionality and playability. The action itself is important, but the optics are even more so. When outsiders see pictures from Old School tournaments showing tables of format staples absolutely obliterated with sharpie, it sends a message that we stand in opposition of Magic as an investment vehicle. It encapsulates perfectly the Old School ethos, that cards are meant to be played with, that experiences are more valuable than value, that people are more important than paper. Some of my most coveted cards are the ones in my collection covered in illegible scrawlings. There have been times someone looking through my binder has seen one of them and realized their signature was on it too, that we had been at the same event without even realizing it. The sense of connection this brings to those around you in the community is unparalleled. The Old Schooler I said all this to has since run his first tournament and sure enough, plenty of value was destroyed that day. And while first timers who played that event may not have arrived at the conclusions I have here, I know that they will go home with something they will covet, and in time they will come to wonder why they regard their scribbled up Revised Drudge Skeletons as the crowning jewel of their collection. And that is why we sign.